Flowers is a game created by NetEnt and whilst it may not appeal to everyone, it does have a cheery bright feel that you can’t help but be drawn to. So, we at Boku Slots have done the dirty work for you and looked to see if it’s worth spending your pennies on. 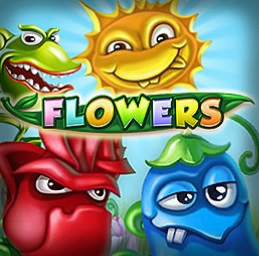 Flowers is a 5-reel, 30 pay line slot that offers an impressive 96.3% RTP to its players. The design of the game is that of a bright country garden filled with flowers of all kinds, including a killer Venus fly trap that would fit right into a scary movie. The soundtrack has the makings of being very relaxing with birds chirping away. However, the noises made by the reels when they spin and land are distracting, so we turned off the sound. 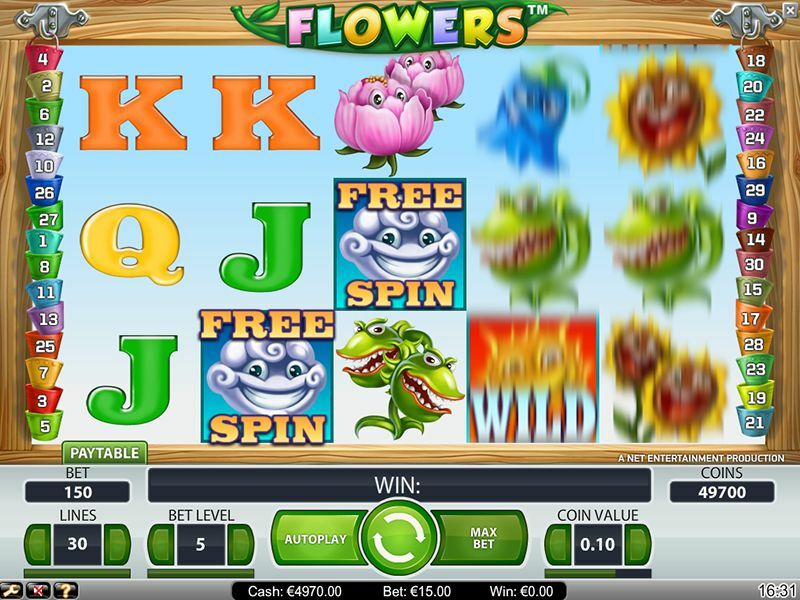 Bet Amounts – Betting on Flowers is adjustable and begins at just 30p on coin level 1 and coin value 1p. If you adjust the scales up or down, you can increase or decrease your bet as you wish. The maximum bet available is £75 at coin level 5 and coin amount 50p. Always make sure you have changed your bet according to your needs. However, if your funds are lower than the bet you are trying to make, it will not allow the spin to go through. Wild Symbol – A rising sun is your wild symbol and it substitutes for all other symbols, except the Wind bonus spin or double symbols. The sun wild is also on offer as a stacked wild and is your highest paying symbol, so land 5 of these to win the 5,000 coin jackpot. Double Symbols – In Flowers there are single symbols and double symbols in play. Each double symbol is worth 2 single symbols. The way this works in your favour is that if you land a single symbol and a double symbol on the same line, it will count as a 3 symbol win. This will give you a much bigger chance of winning throughout the game. Bonus Symbol – The gusty wind symbol is your bonus and landing four or more will trigger the bonus spins. You will also receive a bet multiplier for each time you land three or more of the wind symbols on a winning line. The joy of this is that the bonus symbol offers a single or double option, meaning to trigger the bonus spins you could be lucky and just land 2 double symbols. Eight bonus symbols will award 30 spins and a x10 multiplier. This is where the double symbols really come into play for you, because the higher amount you have on the win line the more spins and the bigger the multiplier you are awarded. Not only that but the spins can be retriggered and the wild symbol becomes stacked too, giving you even more chances to win. We went into this game not expecting much, but we actually came out the other side a lover of all thing Flowers. There could have been a bit more animation where the game is concerned, but it’s a minor flaw in an almost perfect slot. The wins came along after a while and when they did they continued coming. The bonus game didn’t trigger as often as we would have liked for a 96.3% RTP, but the wins on the main game made up for that overall.